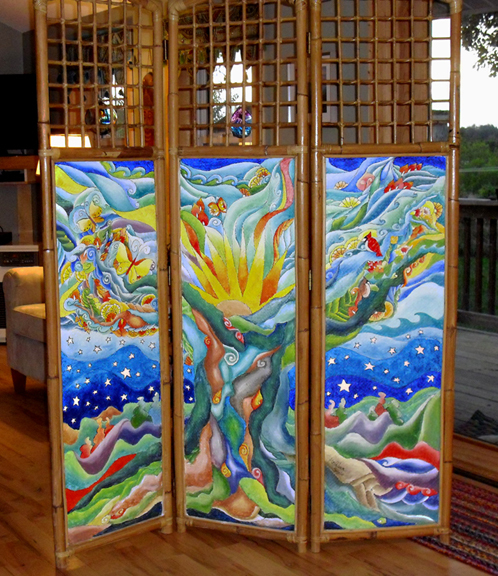 Here’s a bamboo room divider that I finished recently. The client is also an artist so while the surface proved challenging-woven bamboo-the end result proved to be as “happy” as most of my art. It’s funny, my writing is mostly on the dark side but my art invariably sings and shouts for joy. It’s a good thing, I guess, that everything has an outlet-my dark, sad stuff and the bright light that still manages to shine from the paint and pencils. (or pick up a magazine!) in a couple of weeks.